Lord Shiva is infinite and eternal. He is beyond limitation and yet by his independent free will (svatantrya) he has the power to appear limited. He creates the universe for his own play, without beginning or end. In the sixth chapter of his Tantraloka, Abhinavagupta explains in great detail, how in his own body, Lord Shiva creates different concepts of time, to cater for the infinite variety of beings who inhabit the one hundred and eighteen worlds or universes. At the lower cycle of creation there are sixteen worlds or bhuvana’s, one of which is our own universe which contains the earth and solar system. Here, the full scale of human life is said to be one hundred years. But the life of our earth and these other sixteen worlds runs into millions and millions of years, which are divided into smaller cycles of time called yugas. The four yugas, known as satya, treta, dvapara and kali, together total 12,000 divine years, or 4,320,000 human years. These yugas are respectively more and more gross, similar to the golden, silver, bronze and iron ages of Greek Mythology. This is his play, and the sweetest part of this play is that Lord Shiva always appears at various times, and in various ways, for the upliftment of sincere seekers. In the beginning of the present cycle of sat-yuga Lord Shiva appeared in the form of Svacchandanath with five heads and his wonderful eighteen arms. In this form he narrated the various scriptures (tantras) of our Shaivism. In sat-yuga, treta-yuga, and dvapara-yuga, Masters and disciples were so great that they remembered everything instantaneously. There was no need to write anything down or refer to books, hence in those ages they were initiated verbally. When kali-yuga occurred, these Masters and disciples became disappointed, they hid themselves in unknown places in order to avoid the touch of worldly people. Because of this, the theory of the Bhairava Tantras and Kashmir Shaivism was lost. Lord Shiva, however, always wishes to illuminate the universe, and so He reappeared in this world on Mount Kailash in the form of Shrikanthanath. In this form He again taught the theory of the Bhairava Tantras to Durvasa Rishi. After telling Durvasa Rishi to expand the thought of Bhairava Tantras in all the universe without restriction of caste, creed, color, or gender, Shrikanthanath disappeared into the ether. After meditating completely to acquire a real and fit disciple Durvasa Rishi became disappointed. He could not find anyone in this world fit to be initiated, so out of his mental power he created one mind-born son whom he called Tryambakanatha. Durvasa initiated him completely in the way of monistic Bhairava Tantras. Afterwards, he created two more mind-born sons, Amardakanatha and Shrinatha whom he initiated into the dualistic Shiva Tantras and the mono-dualistic Rudra Tantras respectively. All of this was done by Durvasa Rishi for the upliftment of humankind. remains one-pointed in her spiritual practice, she can achieve in twelve days what would normally take one year”. There is no history of this school in kali-yuga. Durvasa Rishi’s mind born son Tryambakanatha, also created his own mind-born son and named him Tryambakaditya, which means “the expansion of Tryambakanatha”. Tryambakaditya created his own mind-born son, and after initiating him he disappeared into the ether. after sitting in long meditation, he found in this world a girl with good qualities, and went to her father and made arrangements to marry. They had one son named Sangamaditya who came to the valley of Kashmir. Like his father, Sangamaditya married and produced a son named Varshaditya, whom he initiated completely in the thought of the monistic Bhairava Tantras. Varshaditya married and produced a son named Arunaditya, whom he initiated fully. Arunaditya also married and created a son named Ananda, whom he initiated and who was also completely informed in all practical aspects of Shaivism. This sage Ananda was the father of Somananda, the originator of the Pratyabhijna School of Shaivism and author of the ‘Shiva Dristi’. Up to this time (800 C.E. ), initiation into the monistic thought of the Bhairava Tantras took place from father to son only. After Somananda this initiation took place from Master to disciple. Somananda was the master of Utpaladeva. Utpaladeva was the master of Lakshmanagupta. And Lakshmanagupta was a master of the great Abhinavagupta, (950-1025 C.E.). Abhinavagupta had many masters of whom he considered Shambunatha, his master in Kula System, to be the most illustrious, Abhinavagupta was a complete authority on Kashmir Shaivism and although he had many disciples, both men and women, his chief disciple was Kshemaraja and the chief disciple of Kshemaraja was Yogaraja. 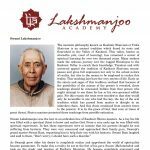 Since its beginning the sacred lineage of Kashmir Shaiva Masters has remained unbroken, yet due to the rise and fall of Kashmir over the past 700 years, it has been practically hidden from view. 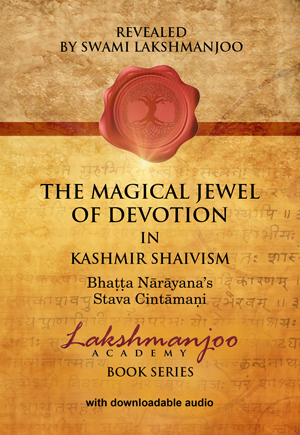 In 1860, Swami Manakak was recognized as a great Master of Kashmir Shaivism. He initiated Swami Ram (1852-1914), who became well versed in the secrets of Trika Shaivism. Swami Ram’s chief disciple was Swami Mahatabakak and his disciple was Swami Lakshmanjoo (1907-1991). 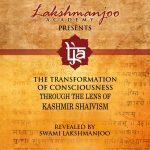 Swami Lakshmanjoo was the last in this unbroken chain of Kashmir Shaiva Masters.